OK, this year’s Steam winter sale has been going on for nearly a week, so I think it’s time I posted some words about a few of the games I got for cheap. The Floor is Jelly is one of those little indie puzzle-platformers with novel mechanics, a genre not invented by Braid but definitely encouraged by it. The novelty is exactly what it sounds like: the floors (and, indeed, all the platform surfaces) wobble and deform as you jump on or into them. Thus, you can make larger jumps by treating the floor like a trampoline. It’s a pretty fun physical system to interact with — it reminds me a bit of Gish, except far easier to deal with, possibly because putting the deformation into the environment instead of the player character makes it more comprehensible, easier to see exactly what’s going on. Nonetheless, it doesn’t take long to become comfortable with moving around in this world, and once you’ve done that, it kind of fades into the background for most of the game. The experience is mostly just that of artistically-stylized platformer, with themed sequences of levels arranged hub-and-spoke, each sequence exploring a new mechanic. For example, one sequence is set around an ocean, with water that bears you upward, effectively inverting gravity whenever you’re under the surface. This at least has some connection to the physics model, in that bypassing underwater obstacles can require jumping high to get enough downward momentum. But then there’s stuff like the sequence about buttons that rotate individual platforms 90 degrees. You can make interesting puzzles out of that, and the designer does. But what does it have to do with the floor being jelly? Towards the end, though, it manages to forefront the jelly again. It does this by mixing things up. The first variant is the subtlest: a sequence of space-themed levels in lower gravity, introducing the notion that physical constants can change. It’s also in this sequence that the game starts to simulate glitching out, putting deadly pockets of screen garbage in your path. This sets up the final gauntlet, where all pretense of representationalism is dropped, and every few rooms, the world glitches out and changes the parameters of physics. At one point the floors stop bouncing back, so that every jump leaves a permanent dent. At another point, the jiggles start amplifying instead of tapering off, so that you have to keep running to outpace the terrifying instability created by your own passage. Each variation is basically an illustration of how the simulation can go wrong. For the player, they’re exercises in coping with wrong worlds. Until the very last variation, which ties the whole thing up in a satisfying manner by simply giving us a world where the floor isn’t jelly. It’s a return to normality, but moreso: the normality you return to is more normal than where you started. I feel like I’d like the game better if it were more about the physics experiments and less about standard puzzle-platformer stuff where the floor just happens to be jelly. But I suppose there’s only so much you can do with a severely broken world. Despite being basically plotless, King Dugan’s Dungeon manages to anticipate the story of the sequels in its last couple of levels. Level 24’s theme is that it’s a city of monsters, or at any rate an imitation of a city with some monsters squatting in it. It’s not the city from The City Beneath, but it’s certainly a city beneath, and may even have been intended by its creator as a substitute for the real thing. That creator is called the “Neather”. He’s essentially KDD‘s end boss, and another big part of how the game anticipates the story to come. Before the sequels, the Neather was the only human presence in the dungeon besides the player, and the only other being with the ability to trigger the orbs that open and close doors. Throughout level 25, he uses this to manipulate the environment from inaccessible control rooms, cutting off paths you want to take and letting monsters out at inconvenient moments. In other words, he’s a symbol for the game designer. This makes it seem significant that so many of the puzzles here end with the player breaking into his control area, causing him to flee to the next room. The game is basically telling you that when you’re done with everything else, your job is to take the designer’s place — and certainly a great many DROD fans have taken that to heart, producing their own Holds. I said before that one of DROD‘s strengths is that everything, even an enemy, is potentially useful in the right circumstances. Even the Neather? Yes. There’s one room that can only be passed as a sort of team effort, as both you and the Neather take turns letting each other through a cycle of doors. I mean, it’s still fundamentally antagonistic: there’s a choice of paths within that cycle, and the Neather tries to choose paths that will prevent you from escaping the room along with him. It amounts to a two-player mini-game. In the end, you have to kill the Neather. The puzzle content forces it, and even at the level of story, it’s arguably a necessary part of killing everything in the dungeon to fulfill Beethro’s contract with King Dugan. And it’s an uncomfortable moment, for several reasons. First, it’s clearly murder. The current version of the game muddies the distinction between murder and monster-slaying a bit by giving some of the goblins lines of dialogue, but generally speaking, you spend this game squishing mindless bugs, not people. Secondly, there’s some implication (in a post-game epilogue, although I think it might have been mentioned in the docs in earlier versions) that the Neather is actually King Dugan’s lost son, who crawled into the dungeon as an infant and was never seen again. So Dugan is unknowingly paying you to kill his own kin. Then there’s the business of Beethro’s nephew Halph, who shows up as an NPC in the sequels. Halph has an affinity for monsters: they don’t attack him, just as they don’t attack the Neather. I haven’t yet seen where they take this in The Second Sky, but there’s a strong implication that Halph is basically becoming a new Neather over the course of the next two games. If, to Beethro, Neathers are monsters, worthy only of slaughter, what does that mean for his own kin? Finally, just in case you’re not already thinking of this killing as a matter worth stopping to think about, the game goes and pops up a confirmation prompt when you try to kill the Neather. It’s not a real choice; you can’t finish the game without killing him. It just gives you pause and maybe makes you stop and look for another way, a way that involves sparing him and bringing him back to the surface with you. In which case you have to give up, tainting your victory with defeat. 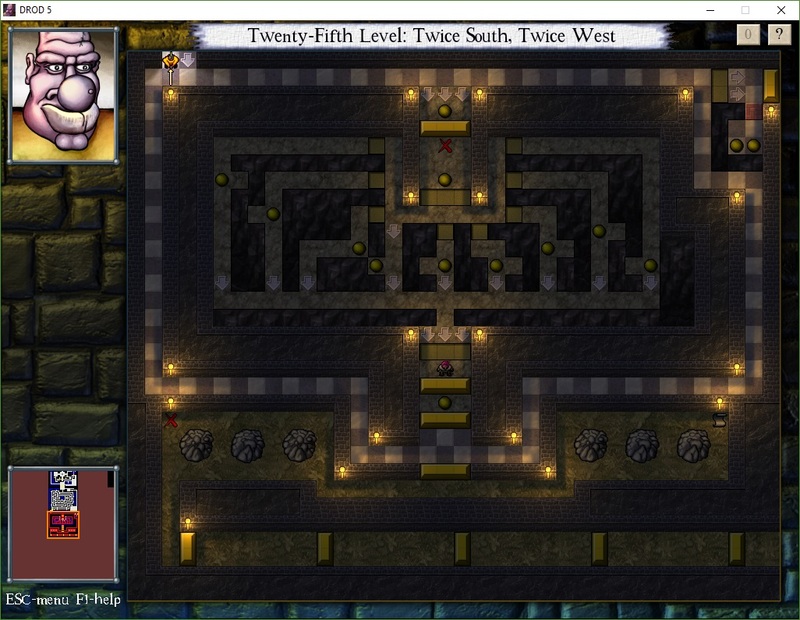 To be clear, even after King Dugan’s Dungeon establishes the pattern of theme levels, not every level is a theme level. There are still a few variety levels, where each room does something completely different. But on the levels where it goes for a theme, it goes hard. I’ve just been through a very strong example of this: floor 20, where the game introduces Brains. I’ve mentioned Brains before. Brains don’t attack you directly, but rather, make all the other monsters on the level a little smarter, giving them access to a simple pathing algorithm that tells them how to get aorund obstacles without getting stuck. Intriguingly, it seems like Brains don’t so much tell the monsters what to do as give them a better perspective on the world. Ordinarily, roaches try to get as close to you as possible, roach queens try to get as far away from you as possible, goblins try to avoid your sword and charge you from the back or side, wraithwings try to stay 5 squares away from you until they can mob you in a group. Brains change none of this. They just change how the monsters assess distance. Without a Brain, roach queens tend to get stuck in corners, where there’s only 3 empty adjacent tiles to spawn new roaches in. With a Brain, you can wind up chasing a queen around a loop if you’re not careful. Serpents seem to be a special case, or perhaps just expose a little more of the general case than the other monsters. Ordinarily, a serpent will make a beeline for you if you’re directly in line with its head horizontally or vertically, and otherwise wiggle around according to a set of rules too complicated to describe here. Add a Brain, and the serpent seems to regard you as always directly in line with its head, and will head towards you according to the same distance rules as everything else. The main effect of Brains is to erase some of your most useful tactics. You can’t just get a pile of roaches stuck behind a wall where you don’t have to worry about them immediately. Everything that’s awake and not completely isolated knows how to find you. Instead, your movements have to be geared towards making sure you don’t have to fend off monsters from multiple directions at once. If you can get them all lined up in front of you in a hallway, it’s really no worse than normal. In fact, the Brain can make things easier at that point, by guiding all the monsters to you so you don’t have to hunt them down. In fact, there’s one puzzle where this is completely necessary: in one part of the room, there’s a roach in a sort of labyrinth where every passable tile is a trap door. You can’t go into this labyrinth, because the trap doors would collapse behind you and you’d have no way out, and it’s set up to be impossible to lead the roach out by the normal roach movement rules. No, you just have to wait for the Brain in the room to guide it out, which means refraining from killing the Brain. It’s kind of like refraining from killing the tar mother in that room I described in my last post. Come to think of it, we can probably generalize this to a pattern: situational advantages of things normally regarded as enemies or obstacles. There’s a whole floor devoted to using goblins to kill serpents. Even the humble roach can be used as an obstacle to keep wraithwings from fleeing out of sword-range. It strikes me that one of the big strengths of the DROD ruleset is that it’s rich enough to support situations like this. Everything has some potential use. Getting back into DROD after all this time has proved fairly easy. All the little tactical swordfighting tricks that I picked up in my first play-through are still with me: how to efficiently cut down a horde of attackers, how to manipulate a goblin or wraithwing into going where I want. A great many individual rooms are still familiar to me, too — not so much so that I’d be able to recall them from memory alone, but enough for me to recognize them when I see them, and remember the main secret to solving them. This seems to be less the case as I go deeper, though. Floor 18 is almost entirely unfamiliar to me. I suppose this makes sense — this isn’t my first attempt at a replay. I recall playing through at least the beginning in preparation for at least one of the sequels. At one point I even started playing through the game to make notes for a Hold 1“Hold” is DROD‘s term for a set of player-made levels. I was contemplating making, a “King Dugan’s Dungeon Condensed” that would attempt to distill the essential features of each floor of the original dungeon into a single room. I never finished that; I think I gave up when I found some floors that were too heterogeneous to easily summarize. The point is, I have played the beginning of this game several more times than the ending. Nonetheless, I’m managing to clear rooms at a pretty good clip, and never really get stuck — except on one thing. The one new, unfamiliar thing. The Challenges. I’ve gotten fairly severely stuck on those several times. Floor 16 had no less than three Challenge rooms that took me multiple sessions to solve. The thing about the Challenges is that they’re fiddly. They involve precise positioning and optimization, often even to the point where you have to already be in the correct orientation when you enter the room, just so you don’t have to waste a turn or two turning about. Without Challenges, most of the rooms in King Dugan’s Dungeon ask no more of you than competent footwork and the ability to spot the “lynchpin”, the non-obvious idea that makes it all easy. A lot of the Challenges are specifically based on ignoring a room’s lynchpin. For example, one of the rooms in floor 16 is based on using tar growth, normally an inconvenience, to your advantage. There’s a serpent in a completely inaccessible area, together with a small bit of tar. Serpents die when they get caught in dead ends, but there’s no dead end in that area. The lynchpin: You can create a dead end just by letting the tar spread all the way to the wall. To do this, you have to ignore the temptation to kill the “tar mother” (the thing that makes the tar grow) for three complete growth cycles. The Challenge for that room: Kill the tar mother before the third growth cycle. I had to learn more than I had ever before needed to know about Serpent behavior to solve that one. I’ve been spending so much more time on Challenges than on anything else that they’re basically the dominant part of my experience by now. Now, bear in mind that Challenges are optional. I could just skip them, solve the rooms the easy way and move on. But why would I do that? I’m in no rush to reach an ending I’ve already seen, or solve more puzzles I’ve already solved. No, for a return visitor like myself, having the Challenges dominate the experience is probably a good thing. 1. ↑ “Hold” is DROD‘s term for a set of player-made levels. There’s a pattern I’ve referred to before as “the DROD model”. In this model, each chapter of a game introduces a new element or concept, be it a monster, an environmental feature, or even just a particular combination of previously-introduced elements that interact in some interesting way. The chapter is then entirely devoted to exploiting this theme for all it’s worth, exploring the different uses that the game designer can put it to and the various ways the player can be made to deal with it. Having been thus introduced, it is added to the palette of things available for general use in later chapters with different themes. This is a pretty common pattern in puzzle games, but I think of it as the DROD model because the DROD games exhibit it so clearly and thoroughly. So now that I’m replaying King Dugan’s Dungeon, I’m a little surprised at how long it takes to find it. The first floor of the dungeon with an obvious theme is Floor 6. 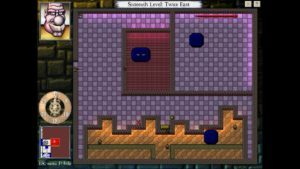 Floor 6 is based on the gimmick of reusing room layouts, keeping the walls and floors the same but varying the puzzles via placement of monsters and orbs and force arrows and the like. I wouldn’t really call this an example of the DROD model, because although this reuse is a striking feature of the floor as a whole, it doesn’t exactly factor into the individual puzzles, and isn’t particularly reusable. (The same can be said about floor 13, the infamous maze level.) Floor 7 comes closer to the ideal: it introduces serpents, and is mainly made up of serpent puzzles — but then it throws in a couple of rooms populated entirely by roaches and evil eyes. You don’t get a floor dedicated entirely to serpent puzzles until floor 12, which fails the model simply because serpents aren’t new — although I suppose you could argue that the theme of floor 12 is really long serpents. Floor 8 fits the model completely: it introduces tar, and every single room in it is all about tar. And the game seems to be mostly pretty dedicated to its theme levels from that point on, except for conspicuously backtracking on its new-found commitment in floor 10. This floor introduces spiders, and starts with a couple of dedicated spider rooms with lots of spiders in them, but then it throws in a bunch of roach rooms, even as the rooms remain thematically spidery in shape. What I find especially intriguing is that the introduction of monsters in the first few levels follow a different commonly-seen pattern. The first time you see a wraithwing, you see only one. It’s in a room full of roaches, on a floor full of rooms full of roaches, and it’s a little while before you see any more. It’s like the game wants to get you used to wraithwings bit by bit by using them as a seasoning on top of roach puzzles before it makes them the main topic. Evil eyes get a similar treatment. This is a pattern that I mostly associate with action games and CRPGs, things based on escalating power. In those games, new enemies appear sparingly at first and become gradually more numerous because that’s how the game ramps up the difficulty. Like, you’ve shown you can beat a Biomechanoid, but can you beat two at once? Six? A whole battalion of them? OK, what if we add a Major Biomechanoid to the mix? Anyway, for the most part, DROD doesn’t really work like that. There is a significant difference between slaying one goblin and fending off three at once, due to the way that they try to flank you, but apart from that, number isn’t strongly related to difficulty. Some of the most difficult puzzles I’ve seen are ones where all you have to do is slay a single roach. 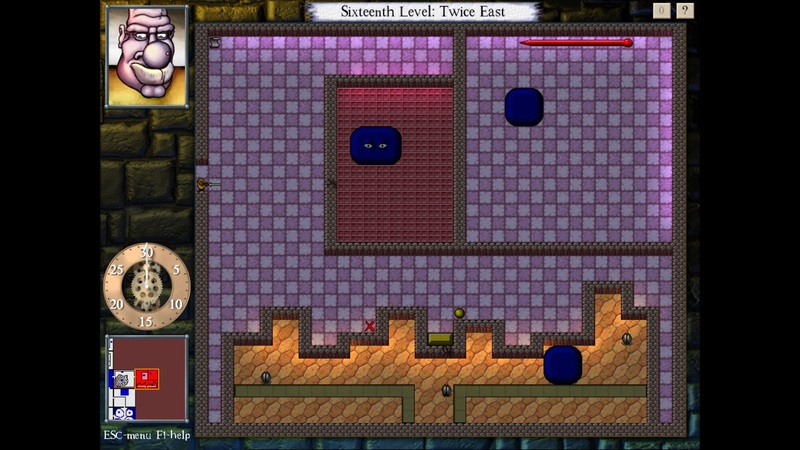 The infamous maze level, for example. It’s been quite some time since I last posted about DROD, and in that time, Caravel has released two more episodes, completing the series. They’re even on GOG and Steam now. I played the fourth episode, Gunthro and the Epic Blunder, during this blog’s hiatus, but I haven’t yet played episode 5, The Second Sky, and I’ve been thinking for some time that I should go back and blog my way through the entire series from the beginning, picking up TSS after replaying Gunthro. 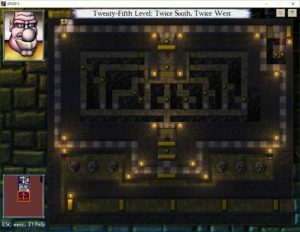 So now I’ve started the newest release of the first episode, King Dugan’s Dungeon, and I’m already up to Floor 13, the infamous maze level. On Steam, the first three episodes are only available as DLC for episode 4. This may sound like a strange way to go about things, but it kind of makes sense: Gunthro is a prequel, so new players who buy it before getting its DLC would be seeing events in chronological order. It’s also a much better jumping-on point than episode 1, both because it’s easier and because it’s overall better-designed — I’ve commented before about how it took the designers a while to figure out what DROD really wanted to be. (As a dev I know recently said, “Games don’t know what they are until they ship. They don’t know what they should have been until 6 weeks after that.”) DROD has kind of the same problem as certain webcomics: because the design has noticeably improved over the course of the series, starting at the beginning means getting the worst possible first impression. In webcomics, artists have sometimes dealt with this by going back and redrawing their earlier strips. 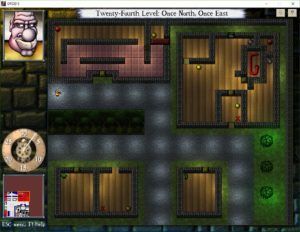 DROD does something similar: King Dugan’s Dungeon has been revamped multiple times over its history. The version I’m playing now has some dialogue lines that I don’t remember hearing before. It’s mostly just comments from Beethro about the puzzle content, but there’s at least one bit where you overhear a couple of strangers on the other side of a wall talking about the Tar Authority, linking the mostly-plotless KDD just a little more to the story of the subsequent episodes. There’s new music, supplementing the originals so that each tune gets re-used less often. There’s something of a clash there, because although the new music is in roughly the same style as the old, it’s considerably less dorky. The graphics are of course updated, and take advantage of the colored lighting and fog effects introduced after the original. In addition to all the UI conveniences of later episodes, there’s one new one: sometimes, you can re-open doors in a previously-solved room by just pressing a button, so you don’t have to go through the motions of hitting the right orbs again every time you want to walk through it. This seems to only apply to a few of the most annoying rooms, though. The biggest change from what I remember is the Challenges. A few rooms on each floor have them, described by scrolls on the floor and tied into the Steam Achievement system: “Clear this room without moving your sword”, say, or “Don’t move diagonally”, or “Only hit the westernmost orb once”. Mind, there’s always been a certain amount of this in DROD. 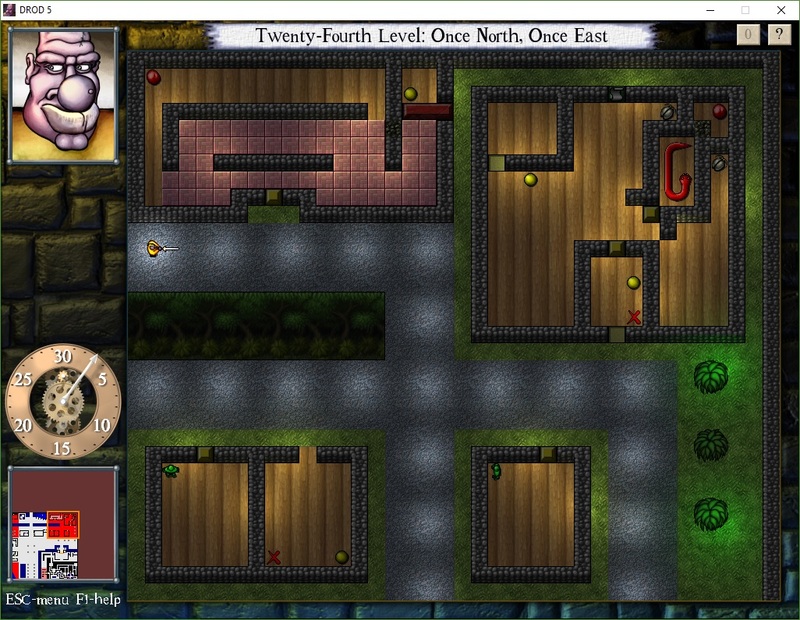 The very first floor of KDD has a room that acts as a sort of tutorial in killing large numbers of roaches in corridors of increasing width, the widest and least defensible one having a small highly-defensible alcove halfway down its length. After you get through it all, there’s a scroll on the floor saying that a true sword master could clear the room without using the alcove. That’s been the case in every version I’ve played. The difference is that now, doing without the alcove is formally recognized. Sometimes the scroll describing a Challenge is easily accessible from the entrance. Sometimes it’s on the opposite side of a green door, so that you need to solve the room once before you can read it. I suppose the idea is that that some rooms are hard enough that you really need to solve them once without the Challenge before you can start to think about solving them with it. But of course I’ve solved all the rooms once or twice already, if not recently. When I see that inaccessible scroll, I try to guess what the Challenge could be — and on the rare occasion that I guess right, and manage to pass the Challenge before reading the scroll, it’s all the sweeter for it. Still, for all the little changes, this is basically the old familiar deadly rooms of death. I’ll have more to say about the experience of replaying them, and what I’d forgotten about them, in my next post. I have to say, Stranger’s Wrath is a vast improvement over Munch’s Oddysee. It just feels more professionally put-together, more detailed and varied. Even the menus feel better. I was a little worried that the shift to a more established gameplay genre would force a mold over it, and there is something to that: much of the environment is FPS brown, including the player character. But it makes up for this with a number of game-mechanical innovations on the formula. I’ve already mentioned one: living creatures as ammo. Then there’s the approach to health recovery. When this game was made, the fashion in shooters had shifted from recovering health by picking up health packs to recovering health by simply not getting hit for a little while. Stranger’s Wrath is closer to the latter: by holding down a button, you attempt to “shake it off”, standing still and hitting your torso to literally expel the bullets that hit you from your body like a wet dog shaking off water. The one limitation is that shaking off damage uses up stamina, effectively trading it for health. But stamina is restored at a fairly rapid clip as long as you’re not doing anything strenuous, like running or fighting, so the end result is effectively the same as in those stand-still-for-a-while health recovery systems, except for one thing: it requires an action of the player. Really, it feels a lot like reloading, just for health rather than ammo. Then there’s the bounties. In order to get money for upgrades (or to save up for your surgery), you have to bring people in, dead or alive. Alive is preferred, but tends to be harder. To bring them in alive, you first have to disable them or render them unconscious — in a clever bit of cartoon/reality merging, nonlethal damage is displayed as the number of stars swirling above an enemy’s head. There are some ammo types specialized for capturing rather than killing, but successfully capturing a boss still tends to require extra puzzle-solving, because of another factor: the bounty-collection device. To collect a bounty, you have to stand over a fallen foe (subdued or dead) and spend a moment sucking them up into your bounty-collector. If you leave a corpse uncollected too long, it disappears. If you leave a subdued enemy uncollected too long, they recover and have to be subdued again. If you try to collect a bounty while people are still shooting at you, you tend to die. And you can’t do it at all if you can’t get near the fallen enemy. There’s one boss who stands on a ledge that you can only reach by climbing along an electrified wire. You can only climb it while the power is turned off, but as soon as you turn it off, she’ll try to turn it on again. The easiest way to keep her from turning the power on is to kill her; to take her alive, you have to subdue her from a distance before starting the climb, and reach the ledge before she can recover. So that’s a nice little puzzle, but even when fighting ordinary grunts, this is a ruleset that encourages finesse, like separating enemies from each other so you can safely subdue and bounty them one by one. As I said about Killer 7, the experimental mechanics are enabled by the weirdness of the story and setting. This game isn’t trying to represent reality, so it can afford things like living ammo and a bounty-sucker-up device. But at the same time, it’s not as driven by gratuitous weirdness as a Suda game. Back to Oddworld, then. The fourth and (as of now) last of the series is something of a break from the previous games, but not as much as you’d think from first glance. It’s a shooter rather than a puzzler, but it’s a fairly puzzly shooter, in a stealth-and-tactics way. It’s Western-flavored, putting you in the role of a bounty hunter in a series of dusty frontier mining towns amidst mesas and badlands, but the outdoors sections of the Abe games had a significant Western vibe as well. It’s more overtly macho than the previous games, with a gruff brawler for a hero, but the previous games had their macho side as well. Indeed, I’d go so far as to say that where the character of Abe was a tough guy disguised as a weirdo, Stranger — that seems to be his name; he isn’t “the Stranger”, he’s just “Stranger” — is a weirdo disguised as a tough guy. He’s a bit animalistic, with a face that’s a bit like a lion and a bit like a goat, and an odd way of using his feet when climbing a rope. If you make him run for a sufficiently long distance, he drops to all fours to run faster. Even weirder, his ammo consists of animals as well: small living creatures scavenged from the wild and fired from a sort of hand-mounted double-barreled crossbow. Instead of looting ammo from your fallen adversaries, you go hunting for it. The one really big difference from the previous games is motivation. Abe and Munch were out to save their people. If Stranger has a people, I haven’t seen them. He seems to be the only one of his kind in a land populated by lumpy outlaws and the chicken people they prey on. No, Stranger’s motivation is money. In the previous games, that was the motivation of the bad guys. It’s been mentioned that he needs the money for a life-saving operation, but the result is that he’s not much concerned with causing destruction if it doesn’t get in the way of his bounties, and is even willing to steal from the chicken people himself if given the opportunity. It does, however, inspire him to take some care with those bounties. Part of the basic mechanics of the game is that bringing them in alive is worth more than killing them. I’ll probably go into that more fully later. Before I go back to posting about videogames, I’d like to talk a little about a board game I’ve been playing that has relevance to this blog, because it draws so much from videogame design. I’ll be avoiding spoilers here. First, the basics: Pandemic is a cooperative board game about disease control. Four diseases have cropped up in different parts of the world, and the players, a team of specialists with different abilities, jet around the globe trying to limit the damage and ultimately find cures. Finding cures is how you win the game, but failing to limit the damage is how you lose it, so the greater part of the strategy is in finding the right balance between these two things. Pandemic Legacy takes Pandemic as its basis, but adds an ongoing campaign mode, where each session has lasting consequences for future sessions. For example, Legacy adds rules about “unrest”: neglecting a problem city can lead to riots, which impede travel. The level of unrest in a city is indicated by a sticker permanently affixed to the board. A player character who’s in a city during an Outbreak can receive “scars” — permanent disabilities that last from game to game — or even be killed, in which case you rip up the character sheet. The very existence of a campaign mode is something of a videogamism, although it has precedent in tabletop wargames as well. But that’s not all there is to it. There’s this whole very videogamey system of upgrades: after every session, win or lose, you get your choice of two, which can give minor enhancements to a character’s abilities, make a specific disease easier to cure, make a research station you built during that session permanent, or various other effects. Now, the overall structure of the campaign is that it proceeds in a sequence of months, the full campaign representing a year of game-time. If you win a game, you go on to the next month. If you lose, you get one do-over: your next game is the same month, but after that, you go on to the next month regardless of the outcome. Consequently, the more you lose, the more upgrades you get. This is a sort of self-balancing of difficulty that I mostly associate with single-player videogames; it resembles the way that the Ratchet & Clank games, for example, let you keep all the money that you accumulate over repeated failed attempts at a mission. There’s an even more obvious self-balancing in the “funding level”, which determines the number of helpful Event Cards you shuffle into the deck: it increases every time you lose, and decreases every time you win. The game’s biggest novelty, though, is something that’s fundamental to videogame campaigns, but virtually unseen in board games: it continually introduces new elements that you have no way of anticipating and have to adjust to on the fly. New rules, new characters, new objectives, new actions you can perform. Some make the game easier, some make it harder, but all make it more complex. Their introduction is managed through a special deck of cards, the “Legacy Deck”, which you work your way through over the course of the campaign, each Legacy card stating on its back the conditions under which you draw it. The instructions on the face of the Legacy cards frequently involve opening sealed boxes containing new game tokens, or punching concealed stickers out of a special sheet and pasting them into the rulebook. There’s generally a Legacy card for the beginning of each month, so that you never quite know what the next month is going to bring. Greg Costikyan has written an entire book about uncertainty in games, titled Uncertainty in Games, arguing that it’s an essential feature of games and analyzing the various forms it takes: randomness, analytical complexity, unpredictability of your opponent’s decisions, etc. The Legacy Deck brings uncertainty through hidden information into a portion of the game were it’s usually absent, and even bleeds it into the negative space between the games. For me, at least, the revelation of the next month’s Legacy card is the part that I find myself most anticipating between sessions. Since this game draws so much from videogame sensibilities, would a videogame adaptation be a good thing? I’ll say this: It does fit my critera for a good asynchronous online multiplayer game pretty well. The turns are longish and self-sufficient, and you don’t get to do a lot of forward planning because it’s hard to predict where the next emergency will be. It even puts the “draw cards” step at the end of your turn rather than the beginning, so that you have something to stew on between your turns. However, being cooperative, it involves coordination between players in a way that works against asynchronous play. Players may need to arrange to meet in a particular city in order to exchange cards, for example. And when they meet, the rules require both players to agree to the exchange, which means out-of-turn confirmations. Moreover, there’s a charm to the board-game-ness that I think would be lost in any electronic adaptation. As I said about the Solitaire Hangman puzzles in Games Interactive, part of the enjoyment of the game is in the analog component, the exercise of hidden information via player participation in punching out stickers and unpacking boxes. Hidden information in a videogame is facile by comparison, and leaves the player out of the process. Even when you have to click or drag or swipe to reveal something, it doesn’t feel the same. The Comp’s judging period has ended, but the results will not be posted for another day. All in all, it was a good year for the Comp, and also a large year: in terms of number of entries, it was the biggest Comp in the Comp’s history. I didn’t play all the entries to completion, but I did manage to play each one at least to a point where I felt comfortable casting a vote on it. Some time back, I set myself a goal of writing posts about half the entries, and I have done this. The ones I skipped were not necessarily the ones that I disliked, but just the ones that I felt I had little of interest to say about. But there are an awful lot of people writing reviews this year, and many of them have insightful things to say about the games I passed over. I particularly recommend Emily Short’s take on Take, a piece that baffled many, including myself. My personal top pick of the Comp is 16 Ways to Kill a Vampire at McDonalds, but due to the large number of entries, I don’t have any confident predictions about what will actually win, or even what will take the Golden Banana of Discord (the unofficial award for highest standard deviation of ratings). I take something of a personal interest in the Banana, because one of my own games holds the all-time standard deviation record. There are a number of strong contenders for it this year, due to all the formal experimentation and “But is it IF?” going on. My best banana guesses are 500 Apocalypses, Game of Worlds TOURNAMENT!, and Mirror and Queen. It seems like there was an unusual tendency this year for games to come in pairs: there were two pieces about vampires, two about zombies (neither of which I’ve covered in my posts), two in steampunk settings, two in settings loosely inspired by Greek myth (both of them first chapters of a larger story), two about gaming tournaments, two where you oversee the development of an entire alien species, two that start with the line “You are a [type of animal]”. There were two Texture games and two Quest games. There were exactly two authors who submitted two entries! I suppose this is just the sort of thing that happens when the number of entries gets large enough, but if it all turns out to be hints towards another hat mystery, I’ll be really impressed.